How to ACE the Ultimate Black Belt Test. A Note to Participants and/or People Who Might Want to Use Their Own Journey to Do Better --and to Do Good. 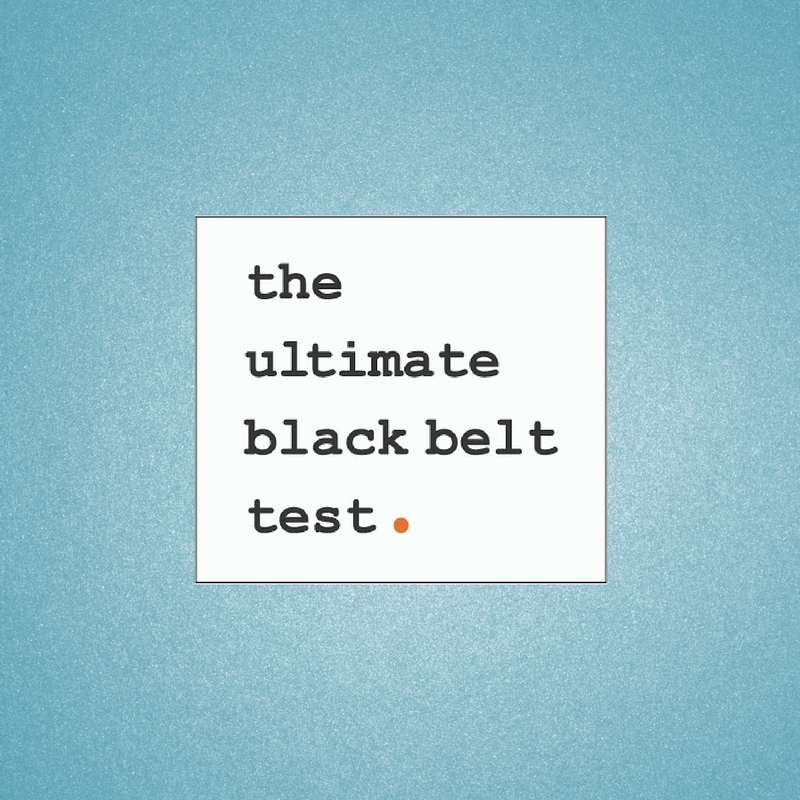 The Ultimate Black Belt Test, as it is today, is a 1 year event, meaning that you begin and participate in the project for a minimum of 12 months. That's 52 weeks or, of course, 365 days. The first and most important goal of these 365 days of living a more "ultimate" black belt test process is to be found in EXERCISE. You must take your body, as it is when you begin, and TRANSFORM it through vigorous, consistent, and purposeful exercise. You have to do exercise that fits your body, accounts for your injuries, and if you've let yourself get out of "example to others" shape, then you must do a make-over on how you approach your day(s) --to include time to make your physical conditioning a top priority. I want you to be a MASTER of how one stays in tip-top fighting shape AS A WAY OF LIFE. I want you to do this so that you can teach others how to do exactly the same. You must first be a living example of the exercise, dietary, and strength building PRACTICES of high level fitness. If you aren't living it, you won't be able to teach it, to use it in your work, to be an inspiration and example to others --and if this is the case, in my opinion, you are NOT using your martial arts as a tool to teach a kind of self-defense that really matters in today's world. If you get NOTHING else from the UBBT process, I want you to shed the fat, gain the muscle, and work your body like the athlete your students want you to be and will admire. Your goal is not only to come to the final UBBT event ripped and fit BECAUSE YOURWORKED YOUR ARSE OFF to get that way, it's also to learn exactly how to help your students to develop life-long practices of health, fitness, and well-being. If you don't do it, how will you help them to do it? Second: The second most important aspect of The Ultimate Black Belt Test is for members to learn how to communicate through writing, photography, and video. If you are truly undergoing a re-boot of your life, setting goals, changing habits, and seeking to live as a master teacher worth his or her weight in gold, then keeping a journal where you spell out what you're doing, what you're learning, what you're changing, who you're learning from, and what you're intending to do and accomplish --is of the utmost importance. The goal is to live a life, for a year, that is purposely more transparent. It's meant to HOLD YOU accountable. It's meant to set an example for how journaling should be done. It shows how conscientious you are --or are not. It's meant to make you a powerful part of a bigger goal. If every member of the UBBT seeks to be the change they would like to see in the world, then collectively we become something far more important and meaningful than any individual's achievements. There is currently no other advanced black belt test journaling program in the entire world. This team, the UBBT 2018, is the only set of black belts on the planet who have pledged to journal for a year --and who, thru these journals, seek to lift the standards for martial arts teachers around the world. I'm talking physical and training standards. Dietary standards. Educational standards. Attitudinal standards. Objectives and goals standards. And standards of transparency, creativity, and achievement. If you want to ace the UBBT, you will first do exactly what it takes, whatever it takes, to completely transform yourself into the best example of physical fitness thru the martial arts lifestyle that you can possibly be. You'll do this with a level of focus and determination that perfectly reflects your commitment to the process. If you don't do this, you may still be an outstanding person, but you aren't actually IN the UBBT. If you don't do this work, you're like the student who announces his or her intent to be a world champion --and then doesn't show up for practice. If you intend to ace the UBBT, you will train yourself to sit in front of your devices and craft at least 52 honest, inspirational, cold-hearted truth telling narratives about your work to BE a real master instructor in today's world of pretenders and people who so often mistake activity for accomplishment. Fitness first, the story of your journey in a close second. If you're training like a maniac, you will have much to show and talk about. If you are also doing many other things, noteworthy things, that's good too --but your efforts will be all the stronger and more important if you will back them up with a body that reflects training mastery --and a mastery of the narrative our community so desperately needs. If you don't have the self-discipline to train and diet, I will question your commitment. If you don't tell your story well, as in learn how to do it, then you will have missed the most important part of what I can offer you as a teacher. You have plenty of time. So now it's time to do the work that will truly help to make you a master of the martial arts. Martial Arts Training and Marketing: Things of The Spirit.